The Lyttel Town writers' collective is taking a break from writing. Our original vision was to share with other communities some of what we are up to as we face the challenges of the present and the future; earthquake recovery, projects putting in place systems for local food resilience, alternatives to the current predominant economic paradigm, simple ways of connecting across fences and neighbourhoods and loads more. We've enjoyed the conversations started in some of the comments. This is what we were hoping for; dialogue that will support others to create the communities they imagine. It is time we find new ways of sharing our love and resources freely with others and with every freely given gift, we say no to an economic system which is killing our communities, undermining our shared humanity and destroying the planet we share in this spinning universe. I've had fun writing. Thanks for reading. If you are new here browse through the archives. If you were inspired by stuff here, take it into your own community. We can't do a local food series without mentioning this humble plant. At this time of the year (and in Spring) when it is still warm but with the damp from the dewy mornings, chickweed really comes into it's own. Take a walk outside and you will certainly see it in your garden. If you have no garden to speak of, just take at a glance at the edges of your yard or in the more wild areas behind the house. It will be there - chickweed doesn't disappoint. I use chickweed in my salads all year round but really it is my staple through the colder months when other salad greens are limited. Chickweed on my crackers or sandwich keeps it green. The ease of harvesting is what really won me over though- it is almost always in residence near the front door. When I am mindful, I harvest with a pair of snips for a clean cut. It prevents the dirty, smudgy bottoms of the plant mixing in with the lush tops - makes for easier cleaning. More frequently I am doing a bit of gardening and I just toss a bundle aside to add to the dinner salad. The snipping method makes for better photos. If you are a smoothie fan, you can also add a handful of these greens to your morning shake. Just toss some in and experiment. Chickweed pesto is popular too. At times, I throw a bit into a stirfry right at the end to give a bit of fresh and raw to the main. For those who want more, here's a nice link, and here for a great identification pic..
Of course, if you are a gardener one of the greatest benefits of cultivating chickweed is that you have an honest excuse for the lack of weeding when those inevitable Tidys come to visit. Practice bravery - show them the garden with pride, pick a bunch of chickweed and rock their worlds by adding it to the shared meal. Yesterday Lyttelton hosted Nicole Foss and Raoul Ilargi of AutomaticEarth as part of their Lifeboat tour around New Zealand. You can hear Nicole here with Kim Hill last Saturday morning or watch her here and here. It is named the "Lifeboat" tour because Nicole is here to speak about how best to prepare our communities as the economic collapse continues to unfold and dovetails with the energy crisis. If you need any convincing, you can also here Nicole speak about it here. It's difficult to imagine a world so radically different in our future than the one we are living today. We struggle to reconcile the story we are fed by Government and the national media each day with the bigger picture behind the scenes. And then there is our common sense: we know that all bubbles blown large enough will pop. In attempting to reconcile all of this information we sway from hope to fear and back again. Personally we can begin preparing: you can read here about what we need to do personally to build ourselves a lifeboat. And in terms of our communities her main message was to just get on with what we need to be doing. Take matters into our own hands and build those horizontal networks across our communities that will provide the trust, the shared resources and the skill base in times of crisis. 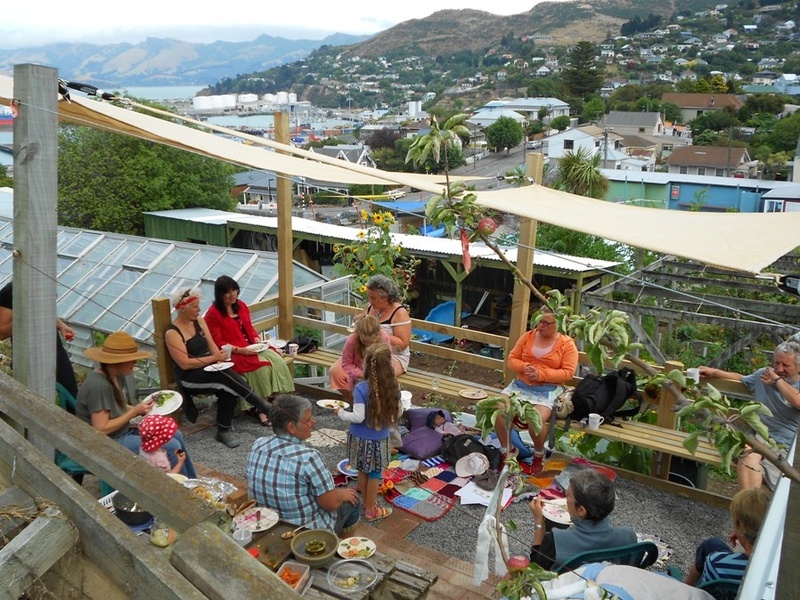 Here in Lyttelton we saw those networks automatically embrace the community after the February earthquake last year. The buildings fell but the community held hands catching any people who were falling. We were able to hold hands because we had networks in place through which we could communicate and access our skill base. We could gather together and quickly find the solutions we needed because the networks had previously done a lot of the groundwork through building trust and belief in our neighbourhoods and our community. Beginning a Timebank. If your community has one, join it and get involved. Write a regular community newsletter to communicate the good news and how people can participate in community activities. Do all you can to relocalise the money in your community: support local businesses, take steps to develop a local currency, gather together a few people to begin a savings pool, start a cooperative in your community that will benefit all the members. Do all you can to relocalise your food security. Start with your own backyard and planting that which you can eat and will bring you joy. Remember the joy. 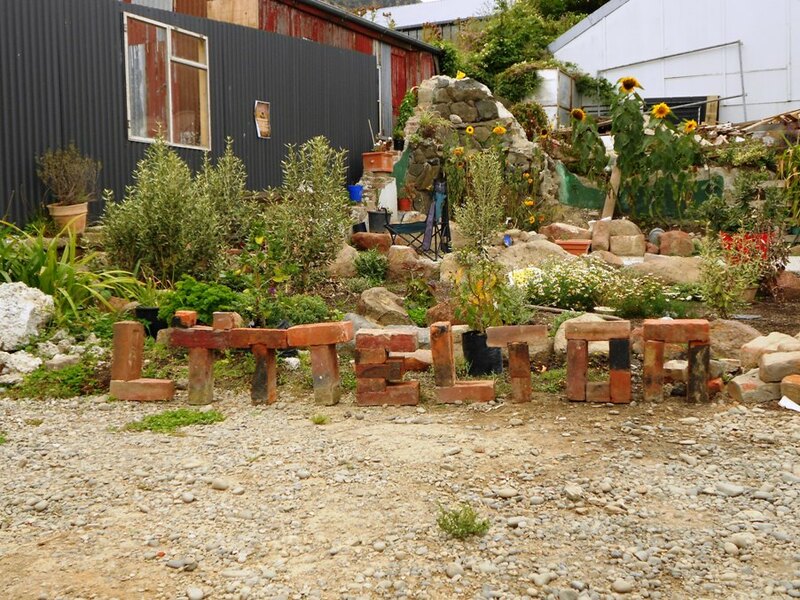 Have a look around for some space for a community garden. If you have children in school, dig up some of the grass and plant some veges. Nurture a culture of gifting, sharing and possibility in your place. Start a wee stand to share produce, seedlings and friendship. Start a group to give out welcome bags to those new to your community. Get to know your next door neighbour and be interested in their well-being. The benefits of these networks give far more to our well-being than the sum of their parts. Trust increases, anxiety falls away, burdens are shared, love grows: the fibre of the lifeboat begins to knit together. We won't be managing the crunch alone, hold hands and begin to build your lifeboat. Do you notice that each year the Black Beauty peaches (often called black boy) are a bit of a surprise at the end of a long Summer and the end of the peach growing season. Such a tasty and pretty surprise. They are dropping all over the Harbour Basin right now. Make sure you have the patience to wait long enough so they are perfect for eating. A ripe Black Beauty peach is fairly unbeatable - don't rush it. If you have come upon a tree dripping with fruit, then you are likely to have quite a few slightly bruised fruit to take care of too. Apart from stewing them and popping them in the freezer for crumbles and pies during the colder months of Winter, here is my favourite jam to make with the the wee beauties. Just half or double the recipe depending on how much you are dealing with. Sterilise jars in a oven set at 100oc for half an hour. Stone fruit and weigh. Put in a saucepan with water and simmer until fruit is pulpy. Add sugar and cinnamon and bring to the boil. Boil for about 20 minutes, enough time to reduce a little. I always add fresh lemon juice near the end to my jam to help it set. Put in jars and listen for the pop of the lids. In the last few weeks it feels like I have joined a secret society. It's hard to get information about foraging mushrooms and we Kiwis tend to be a touch paranoid about them, expecting most of them to be poisonous. I think some of it is probably just some slight discomfort and fear about foraged foods. But this year the world of foraged fungi has opened up to our family. At last. A poster lent by a friend and a dash of curiosity and courage and checking and rechecking identification. We all know the poisonous toadstool so they are obvious to keep away from. Also early on in our searching I found a "death cap". It was good to positively identify it and feel more confident with our identification skills. We chucked it and washed our hands well - apparently you only need a teaspoon of one of those for it to be all over. Now we just have a blanket rule to keep away from mushrooms with white gills. It's an excellent season for mushrooms. Every time it rains, think of them. I have been watching a few over the last few days, waiting for them to plump up and crossing my fingers other foragers don't get to them first. And then it rained last night and they indeed "mushroomed" overnight and were in our frypan this evening. For more information, try here, the library and just start looking and asking around. I'd tell you about some good spots to gather them but they're top secret. This afternoon at the end of a Timebank trade helping a local harvest his hazelnuts, the neighbour led us up to his patch of blackberries and gave us a container to fill. This got me thinking of a blackberry patch I had spied on a walk recently and I headed back there as soon as I had collected some more vessels from home. The berries are are ripe and juicy right now. Check out the scrubby roadsides and track edges for the hidden jewels of Summer sweet. For the next couple of weeks we are going to be prepared for sudden berry finds; we'll keep a container stashed in our bag. I suggest you do too. After all the foraging I was after something super easy to make with them for dessert: a simple blackberry and apple roll was a good solution. Heaped cup of plain flour. Sift flour, baking powder and salt and rub in butter. Mix to stiff dough with the milk and roll out thinly. Peel, core and slice apples and spread onto half of the dough. Place blackberries on top. Roll uncovered dough over top of fruit and press dough closed around the edge. Place in shallow baking dish. Mix glaze ingredients together, then spoon half over roll. Bake at 180oC for 30 mins. Remove from oven and spoon over remainder of glaze. Serve hot with cream if you have it. We didn't. Right now, there are a lot of Summer cabbages coming out of the garden - sweet and crunchy and refreshing. I love raw cabbage and eat it daily through the Winter - I love the contrasting texture it brings to our Winter meals. I also don't mind it steamed - I remember my mum's cabbage and silverbeet steamed up together. For the 70's she was good at not boiling the heck out of it. So as you can imagine I planted a lot of cabbages this season and are sowing more for the next season. Early last year I made my first batch of sauerkraut (pickled cabbage). I had been wanting to make it for a while but had put it off, thinking I needed mountains of cabbage for some reason. Then it dawned on me to do a small batch. Indeed small steps are good in the beginning just in case it all comes out wrong. Now it is a regular in our meals; Gunter being from the Vaterland likes it warmed and with sausages. I prefer it it cold as part of a salad lunch. Whichever way you prefer it, fermented food is full of the goodness of micro-organisms, is a great digestive tonic and tastes wild and alive. If you want to know more check out Sandor Katz's website, the author of the book Wild Fermentation. > Walk into the garden and choose a cabbage or two (or three.) Wash them, take the outer leaves off (the chickens will appreciate them) and weigh the remaining cabbage. Write the weight down or do the maths there and then and move on. The important maths in the sauerkraut equation is adding approximately 3 Tbsp per 2.5 kg of cabbage. > Slice the cabbage thinly and place in a large bowl. > Add the salt and mix it through. I then sometimes let it stand for 20-30 minutes for the salt to start pulling the water from the cabbage. > Place the cabbage into your crock - I use the ceramic inner dish of my slow cooker or a large ceramic fruit bowl we have. At this stage I press firmly down on the cabbage to press water from cabbage and to get rid of the air pockets. Sometimes I use my pestle. Place a plate on top of the cabbage which fits just inside the dish. >On top of the plate use a weight of some sort - previously I have used a rock, weights from some old scales and a jug full of water. The idea is to keep the cabbage tucked under the brine which will appear. > Place a tea towel over the top of the bowl and set aside somewhere out of the way. > Check the crock the next morning. The brine should be covering the cabbage. If it isn't you can just add a bit of salted water to cover the cabbage. > The crock will ferment faster in warmer weather. Try it every couple of days and see what you think. > I usually wait a week, transfer it into a jar and put in the fridge for eating. The sun has come out. I'm heading outside. Happy Sunday readers. We are a writer's cooperative. We write about Lyttelton and the people who live here. Here we track projects, share skills and ideas, inspire grassroots leadership and document what relocalisation looks like. Join the conversations and be part of co-creating our community . Welcome.